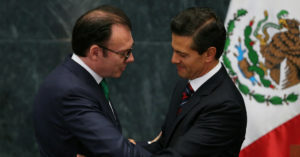 In the aftermath of the controversial visit of Donald Trump to Mexico, Finance Minister Luis Videgaray, Mexican President Enrique Peña Nieto’s closest adviser, lost his cabinet position. The change was announced by President Peña Nieto at a press conference on Sept. 7, a week after the appearance by Trump in Mexico City which was strongly attacked. Officially, Mexican Finance Minister Luis Videgaray resigned, and no reason was given for it in the press conference. But it’s regarded as resulting from the Trump visit, which was apparently Videgaray’s idea. Not only was it his idea, but he had been negotiating about it, with Trump son-in-law Jared Kushner, since August. Apparently though, the Trump thing was the proverbial straw that broke the camel’s back, as there had been rumors about Videgaray leaving for months. Economic growth is sluggish and the economy even contracted in the second quarter. Videgaray was accused (and later officially cleared) of corruption in the case of the acquisition of property from a government contractor. And there were reported conflicts between Videgaray and other cabinet members. Jose Antonio Meade, himself a former finance minister, replaces Videgaray. Luis Videgaray, who has a doctorate in economics from M.I.T., was more than just another cabinet official. Dr. Videgaray was a longtime ally of Enrique Peña Nieto, having worked for him since 2005, when Peña Nieto obtained the governorship of the central state of Mexico (also called “Edomex”). In Edomex, Videgaray worked on restructuring the state’s debt. When Peña Nieto ran for president of Mexico, Videgaray ran the campaign. Videgaray was seen as having a promising political future, as a possible candidate for Edomex governor, or even as president of Mexico. The question now is, how is the embattled Peña Nieto administration going to continue without Videgaray?